A few weeks ago, my Craigslist RSS feed returned a listing for a mill for $300 only a half hour from my house. It was an RF-45 clone that the seller described as a “project.” The RF-45 is a much more substantial mill than the X2 mini mill I currently have, so I was intrigued to say the least. After a bit of thought and contemplating if I had room in the garage, I decided to give it a shot and contact the seller to get some more info. It turned out that the previous owner had begun a CNC conversion on it, and in the process had milled a large pocket under the table in an attempt to fit a much too large ballscrew on the X axis. The mill was disassembled, but all the stock leadscrews and handwheels were included, except for the Y axis acme nut. 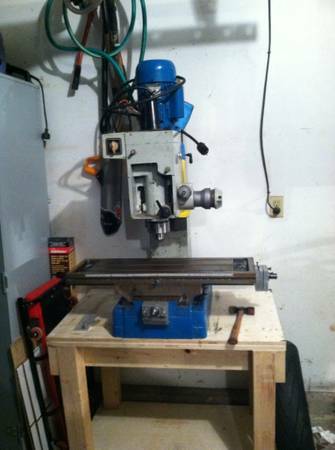 The seller had intended to finish the CNC conversion that the previous owner had so poorly started, but never got around to it since he already had another CNC set up in his garage. Fortunately, he held on to all the parts necessary to run the mill manually. I’m not quite ready to jump into the world of DIY CNC just yet :-). With the goal of expanding our electronics tinkering/troubleshooting capabilities, I’ve had my eye out for a cheap oscilloscope on craigslist or eBay. The search paid off a couple months ago when I picked up two old analog Hitachi oscilloscopes, along with a square wave generator and a couple other vintage items. The scopes in question are the Hitachi V-152F and V-134, seen below. I haven’t been able to locate any date of manufacture for these things, but they’re completely analog. The 134 even has an analog storage function, which is pretty cool. Hi, noticed you have Hitachi V-134 scope – have you located a users manual for it? I haven’t found a manual for the V-134. It’s pretty similar to the 152, with the exception of the trace storage function. I might be able to help you out if you’re trying to do anything in particular. Good luck! I’m also looking for the manual since I just got two V134’s. I cleaned the contacts before watching the video and it works great just like yours. I’m mainly looking for documentation on calibration, which I bet I could figure out but the manual would be nice for doing so.